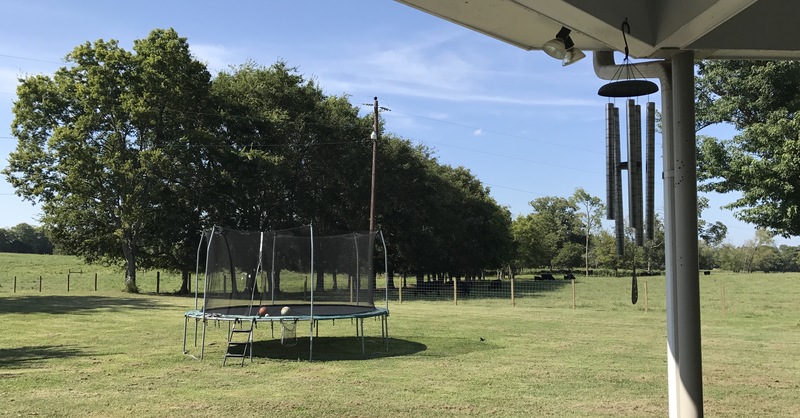 Because of a medical procedure, I am sort of stuck in the house. I went out this morning but found that being inside feels a lot better. Of course, that gives me time to watch television, and some big things have happened. 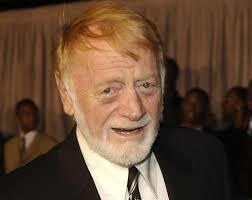 Red West, a member of Elvis’s Memphis Mafia, passed away. He was also in one of my favorite Magnum, P.I. episodes. Hugh Freeze was fired as head football coach at Ole Miss, which makes this post more relevant. Oh yeah, two of my favorite events are finishing up. The Tour de France is in its last stages, and the World Series of Poker Main Event is down to the last table. However, one can only watch so much television. That is why I am cranking up the iPod to see what is going on in there. The other night, we saw The Rolling Stones at LP Field, the home of the Tennessee Titans. Those of you who read this blog on a regular basis know that I am a music lover and am a big fan of concerts. However, I learned something about myself at this one. I do not like stadium shows. Seeing an iconic band like The Rolling Stones is great, but football stadiums are not conducive to a good show. First, the weather has an impact. It was miserably hot and affected my ability to enjoy to music. However, other kinds of weather can mess it up. Rain. Thunder. Lightning. Anyway, the heat was unbearable. Second, there are no good seats. Unless you are in front of the stage or have some sort of VIP pass, there is no good place to watch a concert in a football stadium. You are always far from the stage. That means you can hear a live concert, but you cannot necessarily see a live concert. All of this means that I am a fan of indoor concerts. Good seats are actually good seats. Even bad seats are close enough to see something. People can feel like they are part of an event rather than being on the outskirts of one. On top of that, indoor concerts are climate controlled. I saw Jimmy Buffett in an arena while it was storming outside. It rained enough to flood Nashville over the next several days. Bringing up Jimmy Buffett makes me think of something else. His concerts are known as outdoor parties under the sun. I have seen him outside. I have seen him inside. The indoor shows were better. The same goes for The Rolling Stones. I saw them in an arena and in a stadium. The arena show was better. They may not have performed better, but it was a better experience. A few months ago, we saw Kenny Chesney in concert. It was an awesome show and a lot better than the time we saw him in a stadium. Bottom line, football stadiums are not designed for concerts and the best ones are in smaller indoor buildings. However, I do not want to disparage the band. The Rolling Stones are great, and it is hard to believe they can perform at that level at their ages. 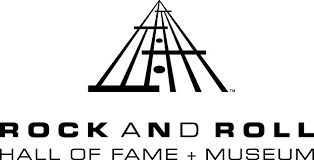 They are a Hall of Fame band, and I want to end this post on a positive note. Since they are in the Rock and Roll Hall of Fame, I thought it would be interesting to see how many members I have seen in concert. I guess it can be done by their year of induction. They are all Hall of Famers, and I can guarantee they all put on better shows indoors. Christmas is almost upon us. All those hours of decorating, shopping and “ugly sweater” partying comes down to a couple of days. In our family, Christmas is spread over a couple of days. The afternoon of Christmas Eve is spent at the home of my parents. Christmas Eve night is a bit of a puzzle. Traditionally, my mom’s family and her mom’s family get together at the exact same time in two different counties. For that reason, we compromise and alternate years. This year, we will go to her mom’s place. Through the years, Christmas Day has been less hectic. We go to my brother’s home for breakfast with his family. For me, that used to be the end of it. We used to celebrate with my dad’s side of the family, but most of them are no longer with us. Since out marriage, we drive a couple of counties away to visit my father-in-law’s relations. In other words, the next couple of days are going to be crazy. Of course, Christmas is like that for a lot of people. We are lucky that our families do not live half way around the world. Drive. Eat. Open gifts. Drive. Open gifts. Visit. Eat. That is a ton of activity. Then, it is all over. The decorations come down. The food leftovers are put into Tupperware. Normalcy returns. In anticipation of the craziness to come, let us explore the craziness of my iPod. Unfortunately, it will not be Christmas themed because there is only one Christmas song on the playlist. 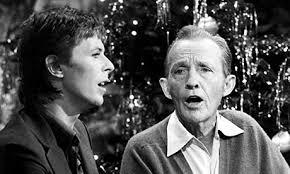 However, I will cheat a little and start things off with that solitary Christmas tune. If I do not get back to the blogging world before Christmas, then I hope everyone has a great one. I am sitting in my office and just finished reading an article about sumo wrestling. My family is upstairs watching a music awards show, and the sounds are making their way to me. There is a note on the desk with a list of blogging topics. Four of them have been crossed out, and two of them are waiting to formulate in my mind. Speaking of my mind, it keeps drifting to class. It feels that I am behind in couple of them, and I am trying to figure out how to catch up. This semester is going by faster than any semester I can remember. It is hard to believe that November has arrived. 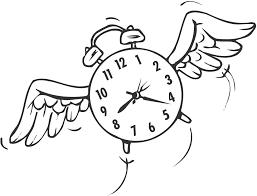 I was always told that getting older makes time go by quicker, but this semester is super quick. An old toy from my childhood is sitting on the floor. My mom was going to get rid of it in a garage sale, but I rescued it. I bought batteries to put into it, and they are sitting on my desk. I should put them in, but I am afraid it will not work. That probably is not important. However, it could cause some slight psychological damage. Another semester has begun, and it is time to get into the swing of things. As usual, the first few days was all about going over the syllabi and explaining to the students the plan for the next couple of months. That means talking about assignments, class rules and all sorts of things. This time I am teaching a couple of survey classes, which students have to take as part of the General Education Core. I am also teaching a class on Middle Eastern history. However, I am really looking forward to the new class on the History of American Music. With that kind of title, the course could go in many directions, but I am focusing on the 20th Century. There are some performers that college students need to know about. In honor of that class and because I need to be working on classes instead of blogging, we are going into my iPod to see what is happening. The music class is going to hear a lot of stuff that is crammed in there. Let us warm it up and get it ready for the semester. In a few days, I will be introducing students to some great artists. Hopefully, it will lead them to like some good music. As you know from previous posts about important people in history and great places in New Mexico, I am a sucker for lists. Whenever I see a book of lists, an irresistible force draws me toward it. The other day I was killing time at the bookstore when a list jumped out at me. It was Rolling Stone: 100 Greatest Guitarists of All Time. To paraphrase Julius Caesar – I grabbed. I scanned. I bought. 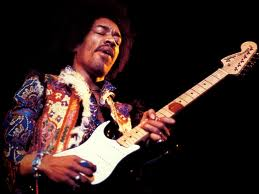 It is an interesting list and begins with Jimi Hendrix, who most people consider the greatest guitarist of them all. Everyone knows how great he is, but few may know that Hendrix honed his craft in the clubs along Jefferson Street in Nashville. There are a lot of great guitarists, at least 100 according to Rolling Stone, but he is the one that I would have headlining my personal music festival. As I looked through the list, I realized that I have seen several of them in person, and that gave me an idea for the Listeria series. Of the 100 greatest guitarists of Rolling Stone, these are the ones that I have seen perform live. The number is where they are ranked on the list. 2. 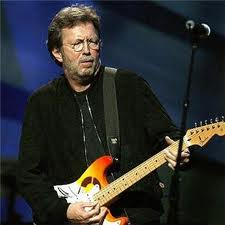 Eric Clapton – I saw Clapton a few years ago. Granted, these aren’t his best years, but he can still play better than anyone I have ever seen. Plus, I had awesome seats. 4. 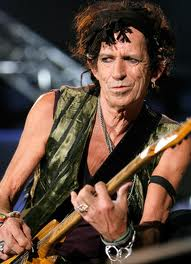 Keith Richards – The Rolling Stones concert was where I learned that seats far away may not be a bad thing when seeing older acts. 6. B.B. 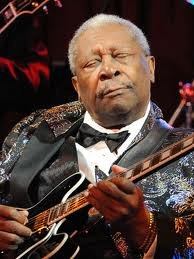 King – I have seen “Blues Boy” several times. The first time I took a stripper as my date. Don’t ask. The last time he told stories more than he played. 10. 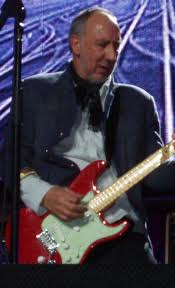 Pete Townshend – Actually, I am fudging a bit on this one. The Who are coming to Nashville in December, and the tickets have already been purchased. 14. 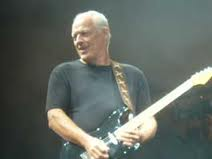 David Gilmour – I saw Pink Floyd in the 1990s, and the concert remains fresh in my mind. That’s despite the fact that my mind was kind of cloudy that night. 16. 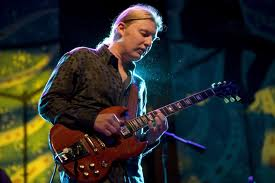 Derek Trucks – This one was an accident. A friend and I were trying to find something to do and decided to check out the Exit/In, a music hall in Nashville. Derek Trucks was playing. It was like a spiritual experience. 19. James Burton – He played at the concert honoring the 30th anniversary of Elvis Presley’s death. The old band played as Elvis sang on-screen. A concert by a dead man was better than most concerts I have seen by living people. I don’t remember it, but I also saw Burton when I saw Elvis as a kid. 23. 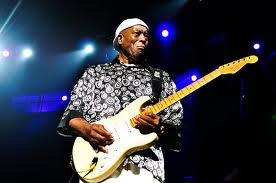 Buddy Guy – He performed at the Ryman Auditorium and cussed a woman on the front row for requesting a song. He said that he was playing for everyone and not just her. Afterwards, he gave her an autograph and a guitar pick. 24. 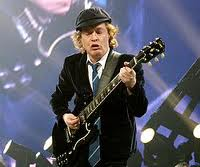 Angus Young – AC/DC is one of my all time favorite bands, and I have seen them more times than I can remember. Young is what makes them go, and the crowd goes wild when he struts across the stage. 27. 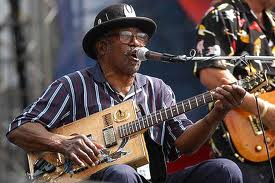 Bo Diddley – There used to be a music festival in Nashville called River Stages. Diddley played in front of the courthouse as we sat in the parking lot. 32. 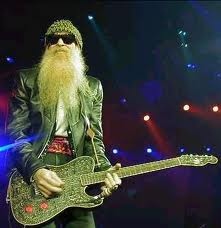 Billy Gibbons – How genius are the beards of ZZ Top? It’s just like the makeup of KISS. No one ever sees them age. 33. 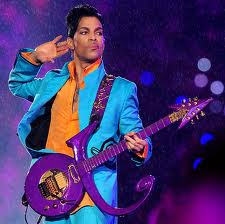 Prince – When he brought out the purple guitar and played “Purple Rain”, the crowd went bananas. 38. 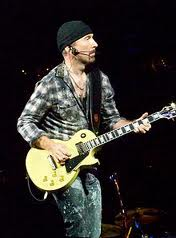 The Edge – U2 played in Nashville last summer. Bono ran around in a leather suit in sweltering heat, but I sensed that The Edge was the heartbeat of the band. 54. 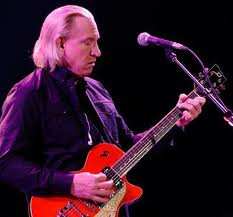 Joe Walsh – He has had success with The James Gang and on his own, but I saw him with The Eagles. The dueling guitars of “Hotel California” may be the best thing I have ever heard. 65. Slash – I wish I could see him with Guns n’ Roses, but, apparently, that is never going to happen. Instead, I have seen him with Velvet Revolver and on his own. I keep hearing that his mom is from Tennessee, but I am not certain about that. 77. 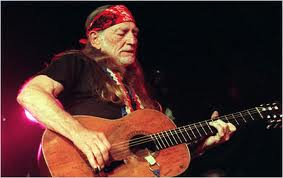 Willie Nelson – He is one of the greats of country music. Ironically, he had to leave Nashville to make it. 84. 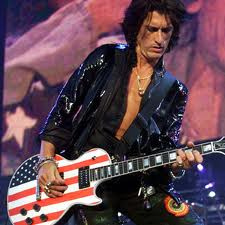 Joe Perry – Aerosmith puts on a great show. When thinking about rock pairings, not many rank higher than Perry and Steven Tyler. 87. 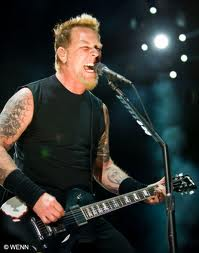 James Hetfield – Once, I was in front of the stage at a Metallica concert and was ready to rock. Then, one of my students came out to work security and stood right in front of me. I didn’t get to do much, but I got a bunch of guitar picks. 93. 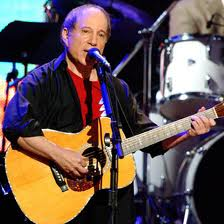 Paul Simon – Luckily, Simon and Garfunkel was not a wild concert. Before it started, the new president of our university came in and sat right behind me. It was the calmest I have ever been at a concert, and he is still our president. 100. 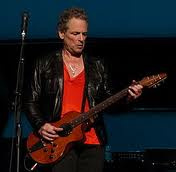 Lindsey Buckingham – Seeing Fleetwood Mac was on the list of things I needed to do. I was disappointed in Stevie Nicks, who I have always had a crush on, because she was wearing orthopedic shoes. However, Buckingham seemed like he hadn’t missed a beat. Guitar Gods – I have seen several of them, but I really wish I could play like them.